Transport secretary Patrick McLoughlin has given the go-ahead for the 3.2 km extension to the London Underground’s Northern Line from Kennington to the site of the old Battersea Power Station, via Nine Elms. Funding will be provided through an agreement between Transport for London (TfL), the Greater London Authority (GLA), Wandsworth Borough Council and Lambeth Council which will use Section 106 and Community Infrastructure Levy contributions from sites in the Nine Elms Enterprise Zone. 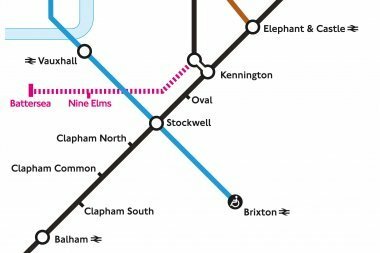 All parties are agreed that the Northern Line Extension should “take a degree of priority” and therefore receive the largest chunk of developer contributions from within the Nine Elms Enterprise Zone. A Tax Increment Financing deal was also agreed to provide additional funding for the Northern Line Extension. It will see the GLA take out a loan of up to £1 billion to fund the project, with a repayment guarantee provided by the UK government. Loan repayments are due to be paid back, in part, through future growth in business rates revenue within the Nine Elms Enterprise Zone. The CIL and s106 revenues will also be used to pay back the loan. An economic study was carried out to prove to the Treasury and the Department for Communities and Local Government that the estimated uplift in business rates would come from genuinely new business growth, rather than from businesses relocating from other areas. The extent of planning permissions in the pipeline was also assessed to help provide an estimate of the future growth in business rates.